Colorado is a state rich in natural landmarks, parks, forests, ski slopes, and a number of cities, each with their own local flavor. Many of these gems are easily accessible as day trips from the capital of Denver, CO, which is located centrally within the state. 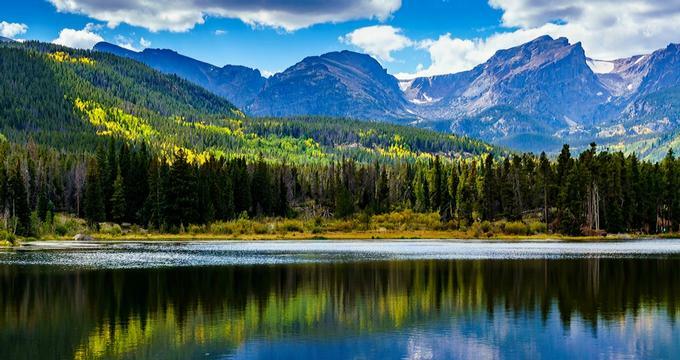 Rocky Mountain National Park and Pikes Peak offer mountaintop fun beyond the trails, while places like Garden of the Gods and Pawnee National Grassland show off the region’s other ecological and geological features. 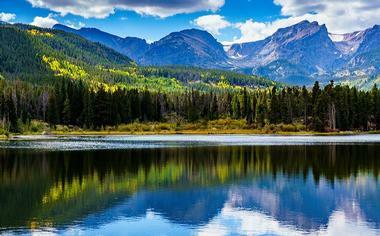 Here are the best day trips from Denver. The city of Boulder is packed with indoor and outdoor entertainment. With over 31,000 acres of parks that include over 200 miles of walking and hiking trails, it’s easy to spend time in nature here. Some places of note are the Flatirons, the rock faces of Green Mountain that give the city of Boulder its name; Chautauqua Park, an extension of Boulder Mountain Park with comprehensive facilities and beautiful landscapes; Flagstaff Mountain; and Eldorado Canyon State Park. 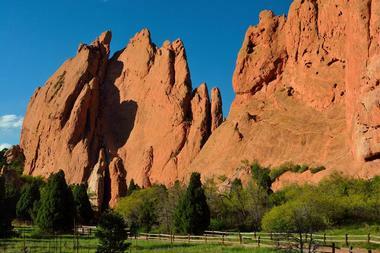 Garden of the Gods in Colorado Springs is an awe-inspiring collection of red rock formations created millions of years ago by transformative geological phenomena. The tall spires of red stone shoot up as if springing forth from the Earth to create a piece of natural artwork spanning more than 1,000 acres of land. Colorado has no scarcity of ski resorts, with Aspen only adding to the extensive list of excellent slopes the state can offer. Situated among the Elk Mountains in White River National Forest, Aspen was established as a mine town during the silver mining boom of the 19th century, but today its identity is almost inextricably connected to skiing. 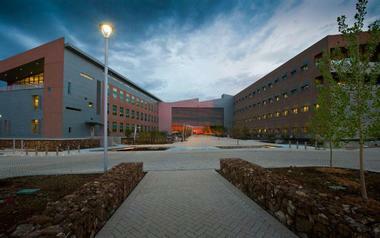 The National Renewable Energy Laboratory, or NREL for short, is a campus of research facilities located outside Denver in Golden, Colorado. This research center is devoted to studying alternative, sustainable sources of energy for the United States and the entire world. The Mount Evans Scenic Byway is the highest paved road in the entire United States capable of supporting car traffic. 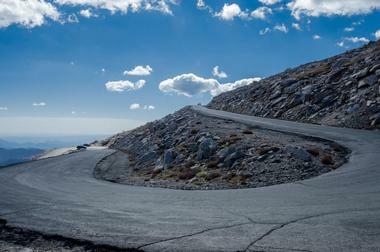 It was built in 1927 to compete for tourists with a similar road leading up Pikes Peak. The road runs 14 miles up Mount Evans and culminates in a parking area and viewing platform near the mountain’s peak. To reach the summit, visitors only need to climb another quarter mile by foot. On Mount Evans, there are several hiking and cycling trails beyond the car-friendly byway. The mountain has unique animal species living on its slopes, including mountain goats, marmots, and big horn sheep. The country’s third most visited national park in 2015, Rocky Mountain National Park is a protected natural reservation spanning three ecosystems, montane (which is made up of grasslands, shrublands, and forests), subalpine, and alpine tundra. The park owes its ecological diversity to its unique topography, which includes the impressive Rocky Mountains, a series of lakes, and even some small glaciers. Rocky Mountain National Park is located in northern Colorado and is a popular location for hiking, camping, and wildlife watching. Trail Ridge Road, which runs throughout the park, allows visitors to enjoy the beauty from the comfort of their cars as well. Somewhat of a misnomer, Buffalo Overlook is a site within Colorado’s Genesee Park where lucky guests can catch a glimpse of bison roaming around a protected area. Although these bison are often referred to as buffalos, in fact, buffalos occur only in Asia and Africa, not in North America. 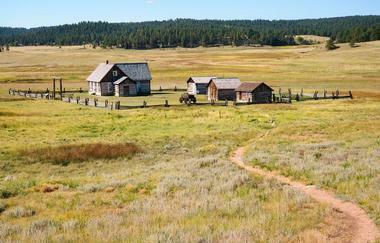 This location is where the first North American bison herds were reestablished in Colorado in 1914. Today, the bison can be seen from a vehicle, as a road equipped for automobile traffic leads up to the point. Although these giants may seem gentle from afar, they are actually quite temperamental and should be looked at, but not touched or heckled. Red Rocks Amphitheatre is a naturally made amphitheater carved into a rock formation located outside the town of Morrison just a few miles from Denver. Built in 1906, the amphitheater sits nestled between several massive red stones in an open area made famous by its outstanding acoustics. Because of this, the venue quickly became a popular site for concerts and festivals and continues to be in use to this day and is capable of seating 9,525 people at each event. The amphitheater is located inside the larger Red Rocks Park, which has many other famous red sandstone formations as well, all of which belong to the so-called Fountain Formation. The town of Vail was established in the 1960s along with the Vail Ski Resort, and it has not lost its identity as a skier’s paradise since. The town is located at the base of Vail Mountain, which is part of White River National Forest and stands as the tallest mountain in Colorado. The mountain is covered in skiable slopes, with 33 lifts and 193 marked trails. The resort town is equipped for skiers and tourists, with pedestrian walkways connecting different sections that have accommodations, restaurants, spas, and shops. Vail also has many non-skiing adventure activities in the summer, such as ziplining, trampolining, tubing, and gondola rides. The town of Fairplay was established in the mid-19th century as the Gold Rush pushed settlers farther and farther west into Colorado. Today, the town remains a quaint yet active center for local fun. Because of its location within the Mosquito Mountain Range, Fairplay is a popular winter destination for skiers, snowmobilers, snowshoers, and even adventurous ice climbers. The Dinosaur National Monument is a national park site that provides a unique opportunity to learn about the dinosaurs that once roamed the western part of the United States. Over 1,500 dinosaur fossils have been distinctly preserved in the rock face of this monument, which spans the border between Utah and Colorado (the dinosaur fossils are only visible from the Utah side). The largest collection of fossils is protected inside a building known as the Quarry Exhibit Hall. In addition to dinosaur bones, visitors to the monument will also find petroglyphs and pictographs carved into the rocks by the pre-Columbian Fremont people. The Dinosaur National Monument is 4 hours 50 min from Denver. White River National Forest, a beloved skiing and hiking spot, is the most visited national park in the entire United States. This is likely because of its massive size (the forest covers 2,285,970 acres), as well as the fact that it incorporates many famous ski areas, including Vail, Snowmass, and Breckenridge, all of which are major draws for tourists each winter. 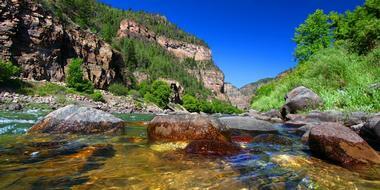 White River also has eight dedicated wilderness areas that show off the forest’s mountainous landscape. It has 1,900 miles of vehicle-friendly roadways and 2,500 miles of hiking trails, making it an excellent place to visit for trekking, wildlife watching, horseback riding, and camping. 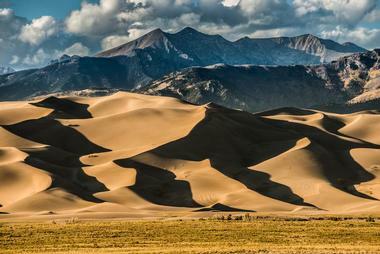 Great Sand Dunes National Park is an unexpected gift from nature in southern Colorado. The park contains the country’s tallest sand dunes, representing a surprising focal point for the surrounding area, which consists of tundra, forest, and grasslands. Bent's Old Fort National Historic Site is a reconstructed historical site that gives Colorado visitors a chance to experience what life was like for fur trappers out West in the 1840s. The original fort was built of adobe in 1833 as a trading post for traders and the local Cheyenne and Arapaho Plains Indian tribes. It was only open for 16 years, but it served as a key checkpoint along the Santa Fe trail for the military, travelers, and adventurers passing through the region. Today, the adobe building has been completely rebuilt, and trained historians offer guided tours of the settlement. Individuals can also hike along a 1.5-mile trail around the building or attend one of the site’s regularly scheduled special events. The Florissant Fossil Beds National Monument is a truly unique display of fossils preserved from prehistoric Colorado. The deposits here are some of the richest and most diverse in the world, with fossils of about 1,700 different species of trees, insects, fish, plants, and other animals. The monument has a visitors’ center with some of the best-preserved small fossils in display cases. In addition to creatures of the past, the Florissant Fossil Beds National Monument’s elevated montane habitat also provides a home for many living animals, such as deer, coyotes, mountain lions, and several types of birds of prey. 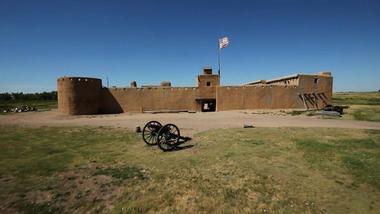 Guided tours are offered, and the monument has 14 miles of hiking trails as well. Camping on site is not permitted. Pikes Peak, the easternmost summit of the Rocky Mountains, is North America’s most visited mountaintop and the world’s second most popular destination peak after Japan’s Mount Fuji. Like many other Colorado sites, Pikes Peak gained notoriety during the Gold Rush of the mid-19th century. The mountain rises over 14,000 feet and is 8,000 feet taller than the nearest town of Colorado Springs. There are three ways to reach the top. The first is by foot on the 13-mile-long Barr Trail. 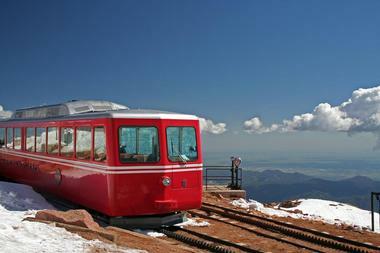 The second is by car along Pikes Peak Highway, and the third, and perhaps the most exciting, is via the Cog Railway. This 9-mile rail line takes several trains up the slope of the mountain to its summit each day, weather permitting. 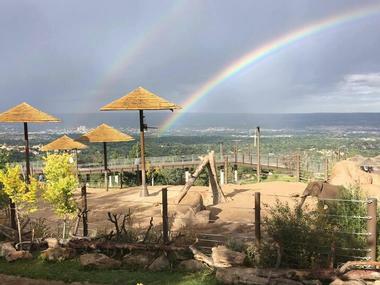 Cheyenne Mountain Zoo is a facility devoted to animal preservation and education and is the only zoo in the country located on the side of a mountain. The zoo has more than 750 animals from over 150 species. The animal exhibits are separated by region and include a section devoted to the creatures of the Rocky Mountains. 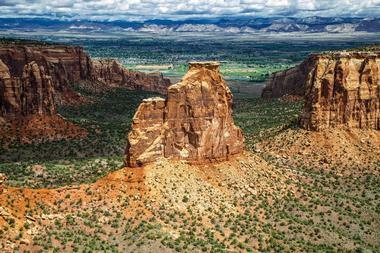 The Colorado National Monument is a red stone canyon formation and a natural treasure of the state of Colorado. Its main feature is Monument Canyon, in which various steep rock cliffs shoot up above a sandy, tree-lined flat area. The Rim Rock Drive scenic road twists among the cliffs for 23 miles and offers stunning views of the monument. Hiking, cycling, and camping are all available in the monument’s park, which also has a visitors’ center with an in-house natural history museum. In addition to the canyon, many come to see the various named rock formations scattered through the territory. The area is also famous for its wildlife, which includes such species as red-tailed hawks, coyotes, and desert bighorn sheep. 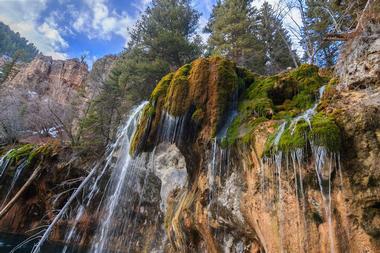 The trail leading to Hanging Lake is one of Colorado’s most well-trodden, and for good reason. The lake shines with a beautiful, unusual turquoise color, which it gained and has maintained thanks to travertine depositions and the action of several unique geological processes. An uphill trail, which is one mile long but nonetheless challenging because of the rocky terrain, leads up to the lake, which seems to “hang” among the Glenwood Canyon cliffs that encircle it. Swimming is not permitted in the lake, but several viewing platforms allow visitors to enjoy the one-of-a-kind green hues displayed by the lake and the verdant scenery around it. 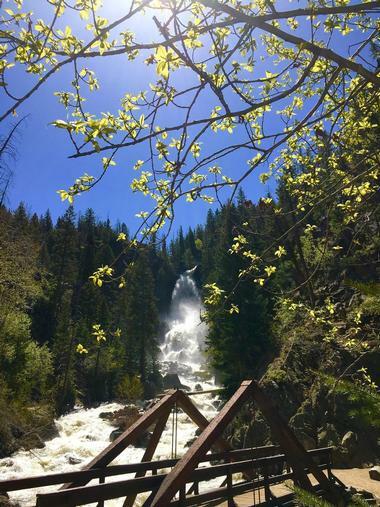 Fish Creek Falls is an alpine waterfall located in Steamboat Springs, Colorado. This 280-foot-high cascade is incredibly popular, particularly because of its location so close to town. The falls have activities for both thrill-seekers and those in search of a leisurely afternoon, with two hiking trails of different lengths and difficulty levels leading up to them. Fish Creek Falls is open for visitors all year. In the spring, it captures melting snow to create a roaring flow, while in the summer, the water is pristine clear with a gentler stream. In the wintertime, climbing enthusiasts can try out ice climbing and snowshoeing along the frozen falls. The United States Air Force Academy is one of the United States’ five university-level service academies. 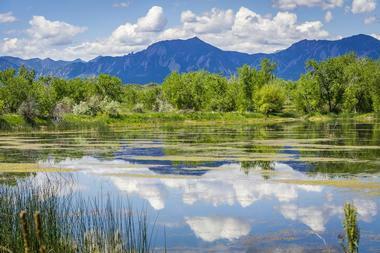 Its campus is located just north of Colorado Springs, Colorado. 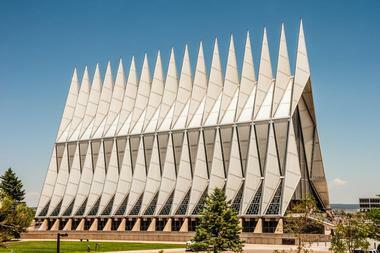 Like many other college campuses, the Air Force Academy’s territory has many interesting buildings and sites to visit. The academy’s visitor center contains a range of exhibits about the educational facility, as well as a theater that shows a short film about the USAFA. Other focal points include the Cadet Chapel and the short nature trail that leads up to it, the Cadet Lunch Formation ceremony, Arnold Hall, and Honor Court, which houses several bronze statues and memorials. The New Belgium Brewing Company in Fort Collins is the maker of some of America’s favorite beers, most notably Fat Tire. The company has been located in Fort Collins since 1991 and now operates another brewery in Asheville, NC, as well. It was established after its founder took a solo bike ride through Europe’s most famous beer villages on his “fat-tired” bicycle and returned home to create his own brews. Today, New Belgium is the fourth largest craft brewer and the eighth largest brewer overall in the United States. Tours to the brewery are available throughout the year. Visitors can learn about the brewing process and enjoy a tasting of the on-tap selection of the season. 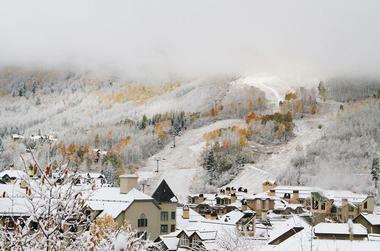 Beaver Creek Ski Area was developed in the early 1970s, when Colorado made a bid to host the 1976 Winter Olympics. Although the Olympic games were ultimately held in Innsbruck, Austria, instead, the alpine ski resort was nonetheless executed to completion and continues to draw skiers, snowboarders, and lovers of snow to this day. The mountain rises to heights of 3,340 feet and has 1,832 acres of skiable area. Twenty-five lifts lead to 150 trails for plenty of skiing options. The resort town also has a number of upscale bars, restaurants, and boutiques for an enjoyable time off the slopes, too. Beaver Creek Ski Area is 1 hour 50 min from Denver. The National Museum of World War II Aviation is a one-of-a-kind museum with exhibits that focus exclusively on the role of aircraft in the Second World War. Located in Colorado Springs, the museum has displays with over 3,000 items and documents related to the war. What sets it apart, however, is its collection of aircraft and vehicles which have been restored to flying and driving condition. Through these true-life objects, the museum aims to tell the story of the United States’ role in World War II and how it impacted the country and its citizens in a significant way. Group, individual, and youth tours are available. Colorado may be known for its snowy mountain peaks and red sandstone canyons, but its grasslands are no less impressive. 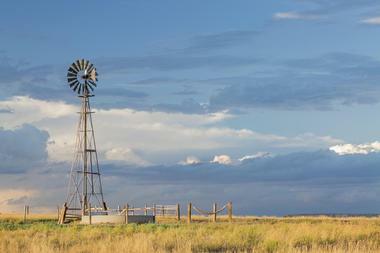 Pawnee National Grassland is a designated protected area covering almost 200,000 acres of expansive grassy terrain. It is located in northeastern Colorado and spreads into Nebraska and Wyoming as well. The most prominent feature of Pawnee is the Pawnee Buttes, two butte rock formations with steeply-sloped sides that have survived erosion in the high plains. Pawnee National Grassland has several hiking trails which lead to the formations as well as camping facilities for overnight stays. Bird watching is especially popular here.